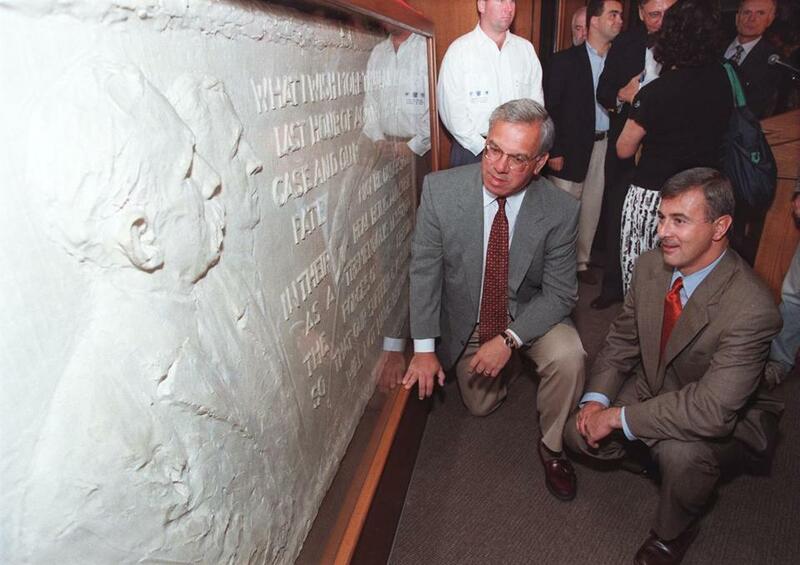 Boston Mayor Thomas Menino (left) and Massachusetts Governor Paul Cellucci (right) at the sculpture’s 1997 unveiling. Since his death last month, longtime Mayor Thomas M. Menino has been memorialized for any number of qualities: his genuine comfort among constituents; his firm control of City Hall; his enthusiasm for the problem-solving side of the job. He’s also seen as a bridge-builder, one who helped to smooth over some of Boston’s old divisions. But there is one illuminating episode that has gone all but unmentioned in the various tributes to Menino. In 1997, the city’s first Italian-American mayor officially accepted on behalf of the city a sculpture of Sacco and Vanzetti, the Italian immigrant anarchists executed 70 years earlier after a trial that many have long held was a travesty of American justice. The sculpture is still on public display now, though barely. As intriguing as it is obscure, it has a complicated pedigree: created by the same man who designed Mount Rushmore, it was repeatedly offered to the city for public installation—and just as often rejected by politicians scared of engaging the raw politics of the Sacco-Vanzetti story. Menino’s decision to finally accept the sculpture was barely covered in the media. But it went a long way toward resolving one of the most divisive stories in Boston’s long and fractured history. In one small act, Menino gave Bostonians and all Americans—or at least those who know where to find it—a bracing lesson about the deeper meanings of patriotism. A CENTURY AGO, Americans feared anarchists much as they fear terrorists today. Anarchism, with socialism and communism, had become popular among recent immigrants frustrated by the lack of opportunity they found on American shores, and some of them resorted to violence to gin up publicity for the cause. Followers of the anarchist Luigi Galleani targeted dozens of elected officials across the country, including US Attorney General A. Mitchell Palmer, whose home was bombed in April 1919. Urged on by xenophobic groups like the American Legion, the federal government waged a widespread campaign to suppress radical organizations. The notorious case and its verdict are still debated today. By April 15, 1920, when robbers killed two workers outside a factory in Braintree, escaping with $30,000, the storm clouds had gathered and were ready to break. Acting on flimsy evidence, the police arrested Nicola Sacco, a Stoughton shoemaker, and Bartolomeo Vanzetti, a Plymouth fishmonger, both immigrant followers of Galleani. Their trial was a mockery of justice: The prosecution suppressed exculpatory evidence and misled the jury, and the judge, Webster Thayer, was overheard boasting about his treatment of “those anarchist bastards.” In 1925, another prisoner confessed to the murders, claiming Sacco and Vanzetti were innocent. But Thayer denied the defense’s request for a new trial. The perception that Massachusetts was about to execute two innocent men, essentially for their political beliefs, convinced many that the American system of justice was blatantly skewed against the powerless. 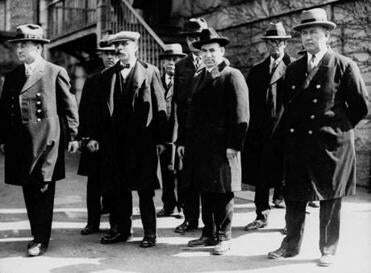 Support for Sacco and Vanzetti spread far beyond radical circles: During the trial, Supreme Court Justice Louis Brandeis hosted Sacco’s wife at his home; Harvard Law professor and future justice Felix Frankfurter assisted the defense team; and Gardner Jackson, a wealthy former Globe editor, coordinated publicity for the campaign. Nonetheless, most of the city’s establishment was convinced of the pair’s guilt or uninterested in their fate, and despite a chorus of outrage around the world, Sacco and Vanzetti were executed shortly after midnight on Aug. 23, 1927. 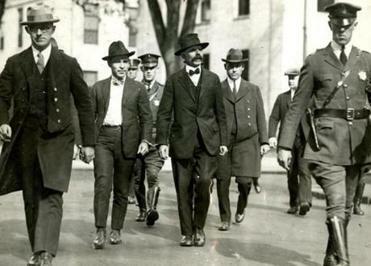 Italian immigrants Nicola Sacco (second from right foreground) and Bartolomeo Vanzetti (second from left foreground) stood in handcuffs with unidentified escorts in Massachusetts around 1927. Among those moved by the case was the sculptor Gutzon Borglum. The son of Danish immigrants, he is now best known for sculpting presidential faces onto Mount Rushmore in South Dakota, a project he was just beginning in the summer of 1927. It is not clear why he became interested in the case of Sacco and Vanzetti. According to one account, Borglum became furious when Calvin Coolidge refused to grant a stay of execution requested while the president was attending the Mount Rushmore dedication ceremony in early August. Other versions indicate that the nationalistic Borglum—a former member of the Ku Klux Klan—only became involved after the execution, when Gardner Jackson wrote to the artist asking him to create a sculpture of Sacco and Vanzetti. Either way, Borglum embraced the mission. Working without pay, he created a plaster mold and sent it to Boston in time for the first anniversary of the execution. Seven feet long and three and a half feet high, it showed the men in profile next to a quote from Vanzetti’s final prison letter. The sculpture—technically, a bas-relief—was supposed to adorn a building dedicated to their legacy. Those plans fell through, but not before Borglum had a New York foundry create a bronze version specifically designed to withstand attack by bullet or by ax. Borglum died in 1941. On the 20th anniversary of the executions, a group of esteemed citizens including Eleanor Roosevelt and Albert Einstein published a demand that the state publicly display the Borglum sculpture. Governor Robert Bradford replied there was “no useful purpose in stirring up the bitter passions and prejudices of 20 years ago.” In 1957, officials again declined the memorial. The original bronze sculpture disappeared, but in 1960, an “anonymous junkman” showed up at the home of former Defense Committee treasurer Aldino Felicani and sold him the plaster mold for $50. Felicani donated the piece to the Community Church of Boston, off Copley Square, which had been active in the Sacco-Vanzetti campaign. Finally, in 1997, to mark the 70th anniversary, Thomas Menino, the first Italian-American mayor of Boston, and Paul Cellucci, acting governor at the time, formally accepted the plaster mold of Borglum’s sculpture from the Community Church. Three metal copies were made—an aluminum relief now hangs in the church, another aluminum one is at the Gardner Jackson Library at Brandeis University, and a bronze can be found at the Gutzon Borglum Historical Center near Mount Rushmore. The plaster was installed in the Special Collections lobby of the Boston Public Library. Yet despite these gestures, the Boston area has done its best to forget the whole affair. The site of the execution in Charlestown is now occupied by Bunker Hill Community College. In Braintree, a plaque on a corner next to a parking lot commemorates the original victims of the robbery, whom, it says, “history has forgotten.” The old Norfolk County Jail in Dedham, where Sacco was imprisoned for nearly seven years and Vanzetti for part of that time, was converted a decade ago into—what else?—luxury condominiums. Accepting the plaster at the library in 1997, Menino announced that a new bronze casting would be installed somewhere outside in public by the year 2000. Since then, a group called the Sacco and Vanzetti Commemoration Society has periodically tried to raise money to finish the job. Suggestions for a location have included tiny DeFilippo Park in the North End and the Rose Fitzgerald Kennedy Greenway. The original idea of the Boston Common apparently remains too politically hot to touch. Millions of Americans every year flock to Mount Rushmore, one of the great symbols of the United States and a ready-to-hand signifier for that easy, riskless patriotism which considers obedience to government as the beginning and the end of civic virtue. Today, this “burning, living protest” can be found on the third floor of the Boston Public Library, down a series of corridors and through several rooms, behind a door that, one out-of-town visitor was recently saddened and surprised to find, is locked on weekends. Richard Kreitner is the archivist of the The Nation magazine, which in 2015 turns 150 years old.